I'm happy that you had a good wine with Easter dinner. The Beaujolais wines are the best bargain, by far, of any French. The district is located just south of Burgundy and the wine is made from Gamay grapes, rather than Pinot Noir as in Burgundy. 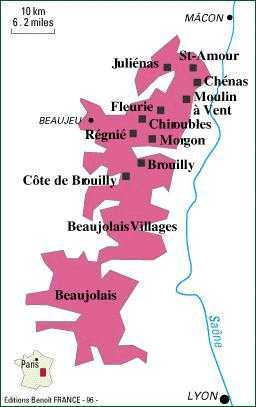 The Beaujolais is divided into a number of communes, the best being Brouilly, Fleurie, Julienas, Morgon and Moulin a Vent. The best wines will have the name of the specific commune on the bottle, rather than simply "Beaujolais" or "Beaujolais Villages". I suggest you try some of the other communes so you can get a full appreciation of the range of great values. By the way, these wines are fully mature 3 or 4 years after the vintage so you don't have to worry about storage. Also, 2003 was one of the great recent vintages. Good luck. As it turns out, the Beaujolais also has its own website, complete with a nifty little appellations map that will give you all sorts of interesting details about each of these communes. As Dad notes, the quality of their product is better than the standard "Beaujolais" or "Beaujolais Villages". (I've tried about half of them so far.) Also, I am of the opinion that the yearly ballyhoo over the "Beaujolais Nouveaux" is just so much hype and really not worth bothering about. All of these wines are readily available and, at least in my area, the individual commune labels run about $15.00 a bottle or so which, for the quality, is a very good price indeed. As a general rule, cheap French wine (unlike some cheap Italians) should be avoided. These, however, are the exception to that rule. Care to join me in a glass, Bill? UPDATE: Speaking of wine, I've mentioned before that we use sherry for Communion at my church. Well, a couple weeks ago, I discovered in the course of making dinner for some friends that this is, in fact, Taylor New York cooking sherry. Drinking an obligatory cook's-tax glass as I stirred my prosciutto and shrimp, I had an overwhelming urge to start singing the Old Hundredth. I've managed to save up roughly $64745 in my bank account, but I'm not sure if I should buy a house or not. Do you think the market is stable or do you think that home prices will decrease by a lot?